That is super cute. Super useful too. So clever and yet a little wrong. I love the colors! The design reminds me of The Partridge Family bus. I got a cheapo fleece blanket in the mail from a "hey you gave you a gift to guilt you into a donation" place. Well, I didn't support the charity and I certainly didn't give them a donation. But what to do with the pitifully thin fleece blanket they sent me? 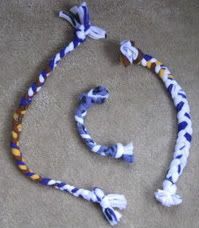 I cut it into strips and made a ton of braided dog chew toys, just like the braided fleece toys I've seen at the pet store. My sister's dog is a heavy chewer - the guy can kill and destuff a toy in a few hours but these braided toys last around 3 days or so. Pretty good for a dog named Chopper! This is a great stash buster project. I now save my fleece scraps and make them up and give them out as Christmas gifts. This so cool. I sent the link to a friend who doens't like plastic toys for her kitties. How fun! I wonder if my one eyed dog would fit into one? He's a pirate too. RRRRR! Those are so cute. You did a good job. My first sewing project was potholders as a gift to my kindergarden teacher. I was 5. Would you come over to my house and revamp my fugly vanity please, please please?! I'm really impressed - especially with the stenciled top. Did you wrap the fabric around anything to make a "bolt" or is the fabric neatly folded?